Movies • The Larry H. Miller Group adds 71 screens to lineup. Steve Griffin | The Salt Lake Tribune Before the Westates acquisition, the Megaplex chain operated 84 screens at six locations in Salt Lake City, Sandy, South Jordan, Ogden, Lehi and Centerville (above). The Megaplex Theatres company is expanding  and, for the first time, outside of Utah. 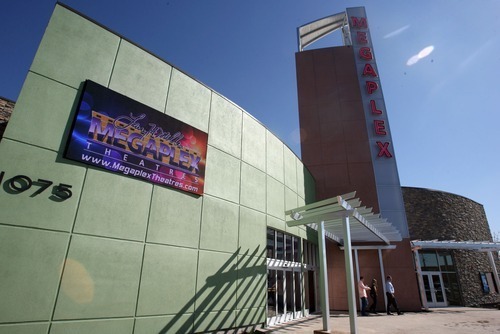 Megaplex is acquiring 11 multiplexes  in Mesquite, Nev., and the Utah cities of Logan, Cedar City and St. George  from Salt Lake City-based Westates Theatres, the companies announced. The acquisition adds 71 screens, and 11,968 seats, to the Megaplex chain, which already operates 84 screens at six locations in Salt Lake City, Sandy, South Jordan, Ogden, Lehi and Centerville. "We are excited about being able to offer the unique Megaplex movie experience to guests in these additional communities," Blake Andersen, senior vice president of Megaplex Theatres, said in a statement. Terms of the deal were not disclosed. Westates Theatres was founded by Tony Rudman in 1958 with one drive-in theater in Layton, and expanded to more than 100 screens in 25 locations before Rudman's death in 2010. Tony Rudman Jr., Westates' president, said the company "is pleased that Megaplex will continue the legacy and vision" of his father. Westates will continue to run the Holladay Center Cinema 6, near the old Cottonwood Mall in Hollday. The company also will continue to operate theaters in Elko, Nev.; Page, Ariz.; and Montpelier, Idaho. Megaplex  part of the Larry H. Miller Group, founded by the late car dealer and Utah Jazz owner  has more expansion in the works. The chain is adding to its eight-screen theater at Lehi's Thanksgiving Point, putting in more screens at the Megaplex 17 at Jordan Commons in Sandy and building a facility at West Valley City's Valley Fair Mall that is set to open in November.